Dino Dan Season 3 Is Yet To Be Announced By Nick Jr.
Dino Dan is an American 30 minute scripted children television series, which kicked off on January 11, 2010, on Nick Jr. and is broadcast every Monday at 19:00. The show is currently in its 2nd season. Nick Jr. is yet to announce the renewal of Dino Dan for Season 3 as well as its cancelation. Sign up to track down the show's status and its release date. 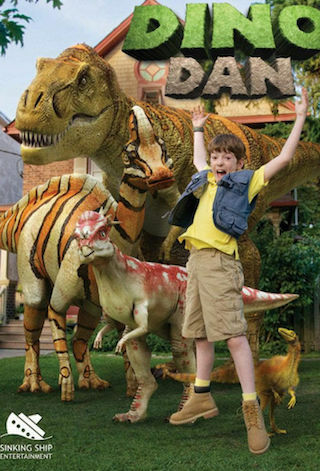 Dino Dan is a Canadian/American television series for children. It is shown on TVO Kids in Ontario, Nick Jr. in Australia and the US, and CITV in the UK. Dino Dan follows the adventures of a ten-year-old paleontologist-in-training, Dan Henderson, and his friends, who uncover clues about the past and secrets of the dinosaurs. The show combines live action with CGI dinosaurs. Dan learns about dinosaurs as he conducts experiments on "dinosaurs" that he sees in his environment. It is unknown if they are real or the result of his active imagination, but other characters accept that Dan sees them. Some animals, such as Dan's dog, have also seen them, and in the episode "Dino Trackers", Dan's younger brother can also see the dinosaur tracks. Related shows by Nick Jr.